Have you met Jose yet? Jose Vieitez is a cofounder of Boomtown Accelerators, and serves as a Director and Portfolio Manager at our Boulder HQ. He’s the founder of five startups, is a CS / MBA / Stanford grad, worked in design at Google, and has lived in five different countries. Jose knows more than a little about a lot of things, and a lot about the important things. Needless to say, we’re psyched to have him around. 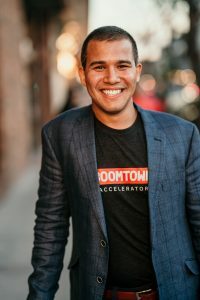 Luckily, Jose is generous with his knowledge both inside and outside of Boomtown: he’s prolific on Quora, where he’s chimed in with nearly 350 answers on topics ranging from entrepreneurship, investing, and software to salsa dancing, career choices, and Puerto Rico. We’ve rounded up some of his boss advice from Quora to share with you here — including one bonus piece of advice about sheep that we hope you never have to use! QUESTION: Why is having a solid team for a startup so important? How should a founder find team members if they don’t know anyone that would benefit their company? ANSWER: Give me a company with growing revenues and significant traction but a “bad” team, vs. a company with a only an idea but a very “good” team, I will take the idea-stage, good-team company 9 times out of 10. A good team can take an idea, learn from customers, build a great product, and then grow a great business. They will be able to weather ups and downs. If the market changes, and suddenly nobody wants the product anymore, they can learn from the market, pivot, and go after a brand new space just as they did in the beginning. They may be behind, short-term, but over the long-term they will beat any other company with more traction but a bad team. On the other hand, if a good business has a bad team, there’s a good chance they will run it into the ground — with bad decisions, team infighting, immoral choices / behavior, or even well-intentioned ineptitude. The bad team might get lucky for a little while, or the business might identify a need in the market that gives them temporary success (until a more talented competitor comes around and outperforms them), but eventually they will fail. They won’t be able to adjust to market changes, and if they have to pivot, they will not know how to recreate their current success. As for finding team members: start talking to people. Share your vision and your idea. You will get feedback, refine your pitch, and find some teammates in the process. If you can’t find the right talent this way, start reaching out to people online and do the same thing: share your vision, get feedback, refine. The talent is out there. More often than not, the reason you can’t get someone to join your company isn’t that the talent doesn’t exist, it’s that the way you are communicating your vision is not sufficiently compelling. QUESTION: What are some mind-blowing facts that sound like BS, but are actually true? ANSWER: You can steal a sheep by spitting on its face. My dad grew up in (communist) Cuba and told me of some of his exploits growing up. Though everyone got food rations, which were enough to survive, they weren’t enough to satisfy — for example, you were limited to five eggs per person per month, among other rations). So people got creative to acquire more food. One of the creative methods was stealing animals from farms. This was dangerous because if you got caught, you’d without a doubt go to jail. So, say someone wanted to steal a sheep. Apparently sheep bleat and are pretty noisy when disturbed: this disturbs the other sheep and alerts the farmer. So one person would lure a sheep away from the herd in the middle of the night by offering it food. Then when it came close they would grab the sheep by its ears, spit in its face, and pull it towards them. (Apparently when you spit in a sheep’s face, the sheep tries to shake it off — like getting rid of a sneeze.) This would last a few seconds, giving them time to wrangle the sheep, and they would continue spitting and pulling until they could get it far enough away to put it in a car and take it.